The Christmas season comes but once a year but now you can turn all those lovely gingerbread scents into a sugar scrub that you can enjoy anytime of the year! I’m a big fan of gingerbread, gingerbread cookies, gingersnaps, gingerbread smoothies…any of it will do! So a sugar scrub that smells like this lovely treat just makes my day! 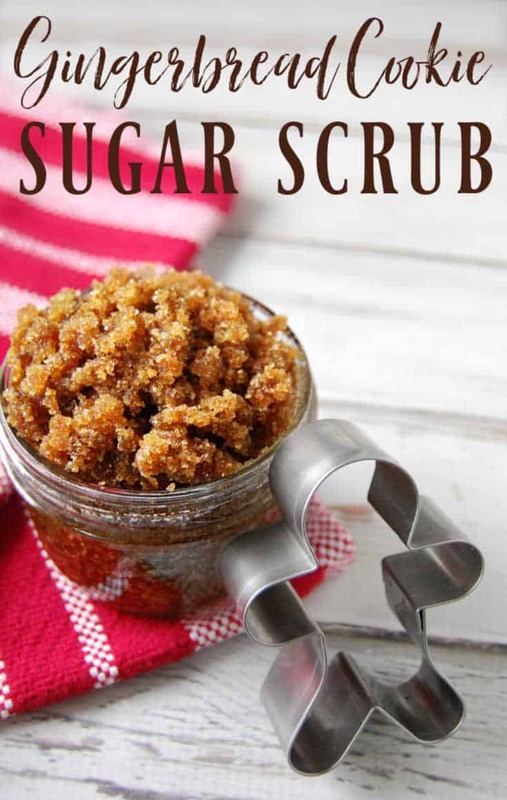 Like all scrubs, this gingerbread cookie inspired scrub will help exfoliate and help moisturize your skin. I don’t know about you but this is just what my skin needs during the winter time! 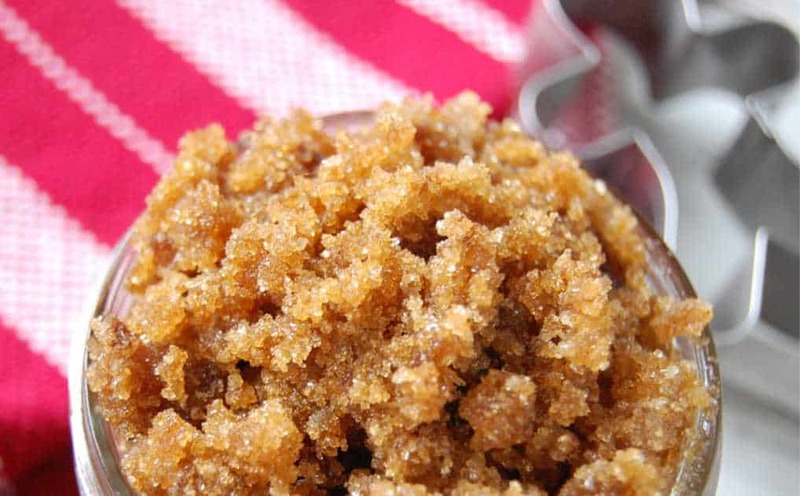 Along with the exfoliating power of sugar and the moisturizing benefits of oil, there are also a few great ingredients that do more than just make this scrub smell like gingerbread men! 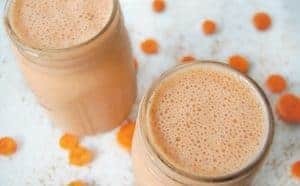 Ginger – Increases blood flow, has anti-aging benefits, helps clear blemishes, and helps tone the skin! Nutmeg – Reduces redness and inflammation. Nutmeg is also wonderful for acne, eczema, and blemishes. Cinnamon – Stimulates blood flow, has anti-aging benefits, and cinnamon great for acne and eczema. Molasses – Not a common ingredient in most scrubs (even the gingerbread versions) but molasses helps brighten your skin, helps with acne, and is exfoliating. 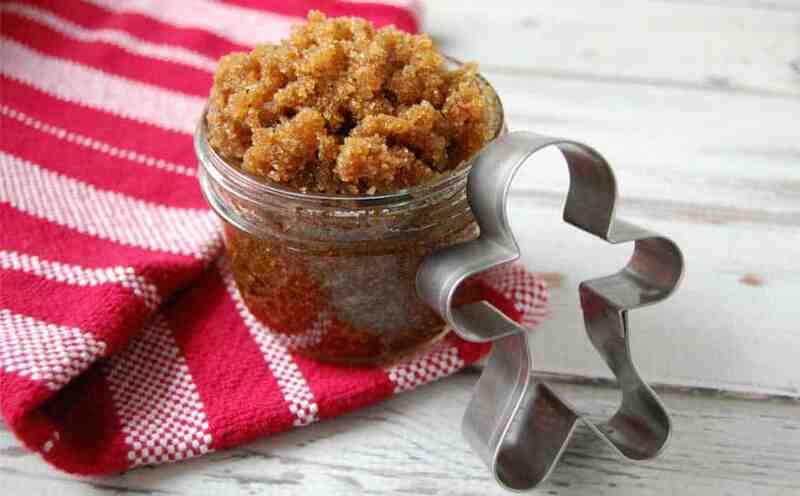 As it’s a proper ingredient in gingerbread cookies, it’s a proper ingredient in this scrub! 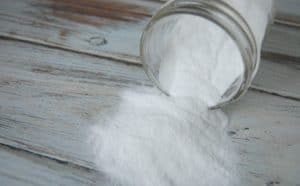 Sugar – You can use any sugar you like; coarse sugar, raw sugar, fine processed sugar, you could even sub in brown sugar but you might want to decrease the molasses if you do. Sugar is what helps exfoliate all that dead skin cells and leaving you with smooth skin. Coconut Oil – You could use any oil in this scrub but I love using coconut oil for a few reasons. Coconut oil is a solid oil or at least it is at temperatures below 76 degrees. This means it’s a little less messy to use this scrub because it holds its shape a bit better. Coconut oil is also an amazing moisturizer which will leave your skin feeling oh so smooth! It’s also helpful for aging as it’s packed with antioxidants. Pour mixture into the container of your choice. To use, gently massage all over skin. Want even more gingerbread skincare fun? 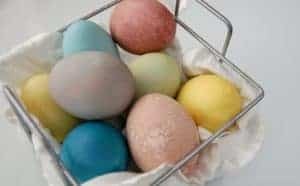 Try these Gingerbread Bath Bombs! That can happen with coconut oil (as it solidify sat temps under 76.) You can take it out of the jars and crumble it (either breaking it up with a spoon or using an electric mixer) Alternatively, if you make it with a liquid oil (like sweet almond oil) then it will not firm up. I used peanut oil (because that’s what I have on hand) and it worked really well, no clumps. I used regular white sugar. You could use raw or coarse sugar but they tend to be a little rougher on the skin. Not horribly rough but not as smooth as store bought scrubs… You could also toss the coarse sugar in the blender for a few seconds to make it finer. Going to.make this as a gift, how long do you think this will last please? Wow! I just made some of this, its terrific! Also, I like sugar in a scrub better than coffee grounds because there’s no clean up. How many ounces did this make? I want to make a few batches for gifts this year! Hi Tara, It will make roughly 2 cups (so 16oz). Basically the amount of sugar you use is the amount of sugar scrub you will end up with as the oil just soaks into the sugar. Does this make the floor of the shower slippery?? Yes, as with almost all oil based sugar scrubs it can make the floor a bit slippery. If that is a concern you can try adding a bit of castile soap to the scrub.